Unleash your creative side with a pottery and clay art workshop. We regularly conduct workshops in our studio for beginners. Join the workshops with the enthusiasm and interest to learn the art of pottery making and its beauty. Pottery Making – The art of making objects out of clayand then baked at high temperatures so that they become hard. – Basic Practice on Pottery Wheel. 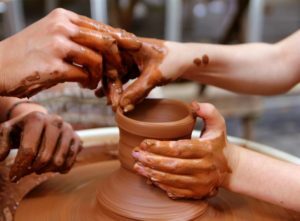 You will get to experience how to turn a lump of clay to make something artistic. Each candidate will get to practice on the wheel. At the end of the workshop, you will take home all the beautiful pieces. 1 made on the wheel and the other using hand building techniques. Handmade products that you make yourself.